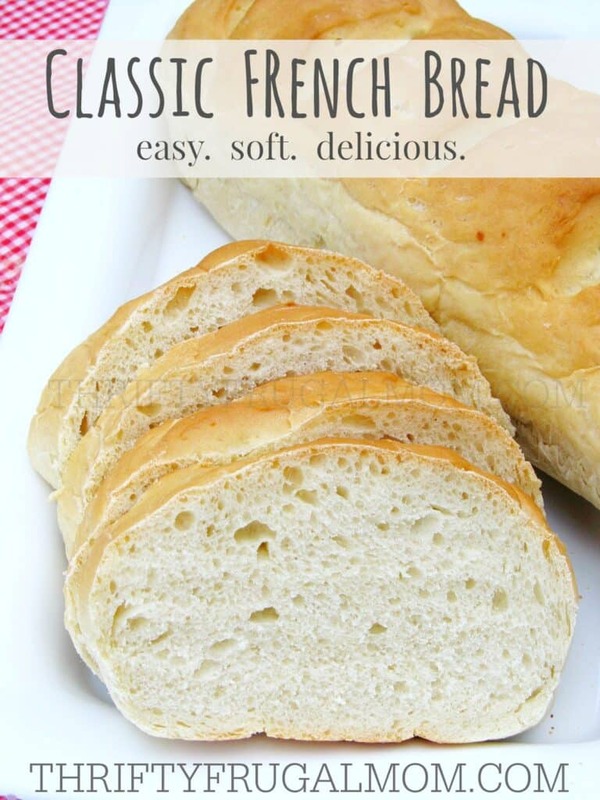 This easy French bread is perfectly soft with a deliciously chewy crust! Plus it will cost a fraction of what you pay for an already made loaf. As you know by now, I love soups! And what goes perfectly with soup? Bread, of course! While I love my 100% Whole Wheat Bread, sometimes I just want a good old crusty bread instead. This classic French bread is the perfect thing to make when I’m in that mood. Plus, there is just something satisfying about making things from dough, don’t you think? I’ve eaten lots of French bread but the first time I had this particular recipe was when my husband’s cousin made it for us a couple of years ago. All of us that were there for dinner that evening couldn’t get enough of it! The thought of making my own French bread always seemed daunting to me, but she insisted that it was really very simple. So, I bravely asked her for the recipe and determined to make it myself. And of course she was right, it really is quite simple! This easy French bread is perfectly soft with a deliciously chewy crust! Mix ½ c. water, yeast and sugar. Set aside. Add shortening and salt to 2 c. hot water; cool until lukewarm. Add yeast mixture then gradually add flour until soft dough. Place in greased bowl, cover with damp cloth, let rise until doubled. Divide in half. Grease a baking sheet and sprinkle with cornmeal. Brush with egg white/water mixture. Bake at 375° for 30 minutes or until lightly browned, brushing with egg white/water mixture after 15 minutes of baking. To be honest, I think it looks nice without the egg wash. :) my mums dad always used to make bread but when he died my mums mum took over and it was never the same. Nana never had the knack for it! Me, my mum and my nana all have the knack for making cakes. Nana's chocolate cake was gorgeous! Bread making doesn't really fall into my family but I am seriously considering doing this. It'll give me something to do of a weekend. Can it be made into rolls? Well, thank you, Kelly! I'm used the shiny look that the egg wash gives it, so it just looked a little blah to me. :) I love that your grandpa made bread- must have been a great guy! And there's nothing wrong with being great at making cakes. ;) I love a good cake and wish I could taste a piece of your Nana's chocolate one. And do try this! It really is quite easy and probably a good bread recipe to actually start with too. I would think it could be made into rolls, you would just need to reduce the baking time. I'd check them maybe after 20 min of baking and if they seem nearly done, do the egg wash and bake till they are a light golden color. Or you can skip the egg wash too. Hope they work out for you! Oh, if you can make homemade bread, then you'll have no problem pulling this off, Kristen! And I never typically do egg washes either, but it does make the crust extra yummy. It's good without it though too, so if you don't feel like bothering, no worries! I have never tried French bread but have always wanted to try. I like how simple this recipe is,and the bread looks great. I'll have to give this recipe a try. Yup, it' super easy. You'll have no problem! I'm brand new to bread making, but your recipe looks pretty easy. How long does it take the dough to double each time - before you divide it and after? I'm so eager to try this recipe! My husband loves a side of French bread when we have lasagna. Yes, this is a great recipe to start with Susannah! It's very forgiving. I'm not sure how long it takes for the dough to double because it really depends on how warm your house is. The warmer it is, the faster your bread will rise. I'd say it typically might take 45 min., but that is just a guess. And the doubling thing doesn't have to be exact, so don't stress out about it too much. Hope it's a hit with the husband! It's fun to make things that they enjoy, isn't it? I hope this helps. I heat my oven on the lowest setting when that is reached I turn it off. I put my bread in the oven to raise. I have a very airy farm house and this works all the time. What a great tip, Sara! I am not a super patient person and it can take SO long for bread to raise for me in the winter. Oh, that's a smart idea! Thanks for sharing! Hi there! Visiting from Turn It Up Tuesday. I love all kinds of bread and French is probably one of my favorites! Your bread looks so yummy! Thanks so much for sharing the recipe. I've tried to make bread with a bread machine a couple of times and diskliked it every time. I think I should give bread making another shot. Oh do, Ashley! This recipe is so easy, I'm pretty sure you'll love it. I've never used a bread machine- to me they seem like it would be harder, but then I have a Bosch mixer that does all the kneading for me so that definitely helps! Does anyone have any suggestions for making homemade bread in high altitude ?!? I recently moved to Denver and need to get used to mile high baking! I don't know if anyone else will have recommendations for you or not, but I did a quick Google search and came across this info from Taste of Home that you might find helpful! Sounds wonderful! My family could never eat this much bread. Do you have any tips for freezing? Should I freeze before or after baking? I typically bake it and then freeze it. As long as you wrap it well, it should be fine. Sometimes I even cut the loaf in half or into slices so that it fits better in a freezer bag. You could also half the recipe. The only issue would be the egg white and that isn't really that big of a deal since you technically don't need to even do the egg wash if you don't want too. Hope that helps! Thanks for taking the time to come back and let me know, Jolene! 😊 And I'm loving that your 12 year old isn't scared of making bread- and motivated enough to do it on her own. Glad you all enjoyed it so much!